Purpose: To stay alive against the threat of the Fury. Affiliations: None - everyone else is already dead. History: (Daredevils#9 (fb), BTS) - On Earth-238 superhumans had walked amongst humanity since at least the 1940s. (Daredevils#8 (fb), BTS) - On Earth-238, the British politician Sir James Jaspers, secretly an insane mutant with reality altering powers, made a televised speech decrying the dangers of superhumans. Hiding his true motivation - to eliminate any superhuman competition - he cited the U.S. President's recent pardoning of the rampaging Hulk as evidence that mankind had foolishly welcomed monsters into their midst. "Many of the creatures are individually as powerful as entire armies! And they number in hundreds...hundreds!...These monsters ignore our laws and threaten our freedom, yet we welcome them with open arms! They must be contained!" (Marvel Superheroes#388 (fb)) - Subtly influencing the electorate with his powers, Jaspers campaigned against the superhumans under the slogan "If they were honest, they wouldn't wear masks" and "Keep Britain human." (Daredevils#9 (fb), BTS) - Anti-superhero legislation was passed. Anyone considered to be even vaguely superhuman was to be rounded up and placed into concentration camps. Many superhumans were captured, but others went into hiding. (Marvel Superheroes#388 (fb)) - Jaspers suggested exterminating the superhumans, and the concentration camps became death camps. The madman created the Fury, a killer cybiote, to track down and eliminate any who had evaded capture. (Daredevils#9 (fb), BTS) - At least some executions were public events, with heroes slain while wearing their costumes, after which torn scraps of bloodied capes and masks were tossed to the screaming crowds. Some of the fugitive heroes, such as Captain U.K., unable to help their captured fellows, watched these events with horror. (Daredevils#8 (fb), BTS) - The surviving heroes huddled together in small groups, waiting for the Fury to find them, waiting for genocide. (Marvel Superheroes#388 (fb)) - Surrounded by a sea of costumed corpses, the remains of earlier victims, the Fury battled three of the native superheroes of Earth-238. One of them was the Iron Tallon, who was attacking the killer cyboite with waves of electricity from his claw-like left hand. Apparently oblivious to this assault, the Fury slew another hero, the Crusader, while Bash Street Bunty charged towards it. (Marvel Superheroes#387 (fb) BTS) - The Fury killed the Iron Tallon. (Daredevils#7 (fb)) - Other surviving heroes took shelter together, but the Fuy soon tracked them down. The heroes stood waiting as the cybiote pounded away at one of the walls of their hideout, a wall which was now visibly starting to give way. Rick informed his wife, Captain U.K., that they had lost contact with the Tallon, and that the Fury must have gotten him. She was stunned by this news, and as he tried to comfort her, she stated the hopelessness of their situation -- "Don't you understand, Rick? This time we aren't going to win!!" The wall crashed in with a final blow from the Fury. In seconds it had ripped Android Andy apart and roasted the supposedly indestructible Tom Rosetta. 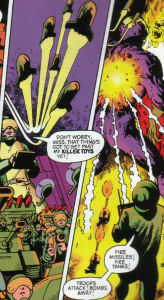 Its blaster blew away the entire right side of Miracleman. Unable to make a difference, the helpless Captain U.K. continued her terrified conversation, telling her husband Rick that she didn't want to die like this. Colonel Tusker tried to reassure her that his killer toys would hold it off, unleashing missiles, tanks and miniature soldiers upon the Fury, who (preoccupied with incinerating someone else) didn't even glance back as it blasted Tusker into oblivion. Realising that they only had seconds before the Fury turned its attentions their way, Rick grabbed his wife and flew her over to the one-man transporter booth, telling her he would send her as far away as possible, and follow later. Their flight, however, drew the attention of the cybiote. Rick had no time to calibrate the controls properly to plan where Captain U.K. would arrive, only just having time to activate the process before the Fury grabbed him around the neck and killed him. Her husband's demise through the clear glass of the booth was the last sight Linda McQuillan saw of her homeworld before she was teleported out. (Captain Britain II#14) - However, several years after this event, the Omniversal protector Roma reached back in time and rescued Rick, so that he disappeared just before the Fury grabbed him. The Fury paused for a moment, confused, before returning to the slaughter of the remaining heroes. 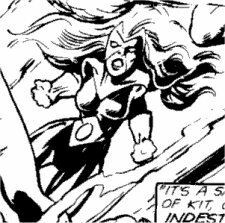 (Marvel Superheroes#387 (fb) BTS) - The Fury slew every superhuman on Earth, except for its creator, Jaspers, who it was programmed to leave unharmed. With no targets left, the Fury was mothballed, placed in storage under the aegis of the government's Status Crew, who would be able to reactivate it should superhumans ever reappear. (Marvel Superheroes#388) - Some reverence apparently remained for the late superheroes, as their remains were properly buried in a superhero graveyard commemorating them. (Marvel Superheroes#387) - A decade later, the Fury was reactivated to deal with Captain Britain, and recalled killing the superheroes of its own world, including the Iron Tallon, Colonel Tusker and Miracleman. (Marvel Superheroes#388) - Captain Britain wandered through the graveyard of the heroes of Earth-238. He viewed the tombstones of many of them before coming across the open and unfilled grave of Captain U.K. 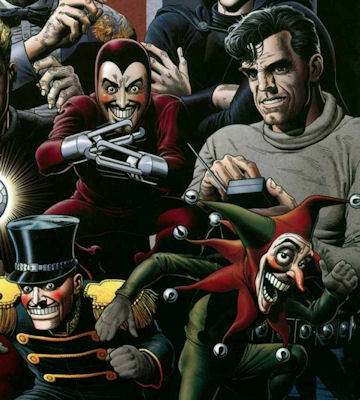 Comments: Most of the superheroes of Earth-238 were based on old British comic book heroes, adapted by Alan Moore and Alan Davis. The Rosetta Stone is a black basalt stone found in 1799 that bears an inscription in hieroglyphics, demotic characters, and Greek, and is celebrated for having given the first clue to the decipherment of Egyptian hieroglyphics. The heroine Bash Street Bunty was named by Alan Davis for the Earth-238 entry in All-New OHotMU Hardcover#3. Kid Miracleman: (Marvel Superheroes#388 (fb)) - Amidst the hero corpses littered around the battling Fury was the body of Kid Miracleman (see comments), the third and youngest member of the Miracleman trio. 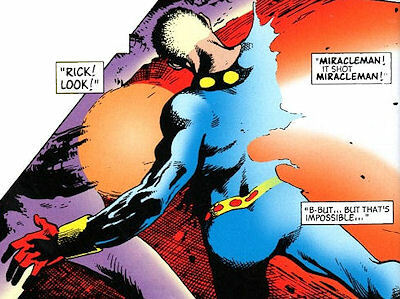 Comments: Though not specifically identified in the comic, the distinctive collar design on the body closest to the reader apparently identifies the frontmost corpse as one of the Miracle family; since Miracleman and Young Miracleman (a.k.a. Rick) were still alive for the final assault on the last bastion of the heroes, this corpse was presumably Kid Miracleman). The Earth-238 entry in All-New OHotMU Hardcover#3 confirmed his identity. 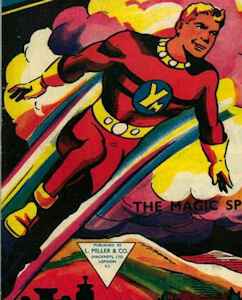 Originally appearing in L.Miller and Sons' Marvelman Family, Johnny Bates, the youngest member of the Marvelman family never had his own comic, unlike his two partners. Perhaps this is why he had turned into a psychotic villain by the time Alan Moore brought him back as an adult a few years later in the Marvelman strip in the U.K. Warrior comic. 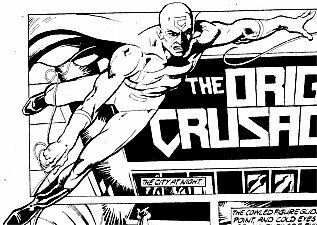 Crusader: (Marvel Superheroes#388 (fb)) - The Crusader fought the Fury alongside Iron Tallon and Bash Street Bunty, but was struck by the Fury's energy blast and presumably slain. Comments: Though not named in the story, the Crusader, a hero created by Alan Davis for a short story, is identifiable by the distinctive C logo on his mask. A Batman-like hero, in his own strip he was seemingly killed on his very first mission. Bash Street Bunty: (Marvel Superheroes#388 (fb)) - Bash Street Bunty fought the Fury alongside Iron Tallon and the Crusader. Comments: The only Earth-238 hero not based on actual characters from other British comics, she was not named in the comic, but was subsequently given a name by Alan Davis for the All-New OHotMU Hardcover#3 entry on Earth-238. Despite not being a direct homage to an existing character, the name Alan chose still references British comic history, with the Bash Street part of her moniker originating from the long-running Beano comic's rebellious school pupils the Bash Street Kids, and Bunty being the title of a long running girls' comic. 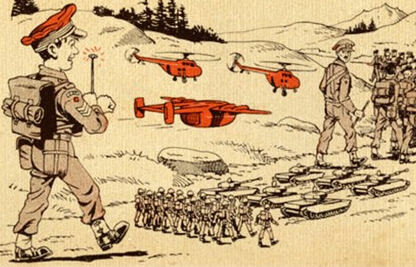 Colonel Tusker: (Marvel Superheroes#387 (fb) BTS / Daredevils#7 (fb)) - Using a hand-held control panel, Colonel Tusker commanded a remote controlled army of killer toys, including miniature soldiers, missile batteries, helicopters, fighter jets and tanks. (Daredevils#7 (fb)) - The Fury invaded the last surviving heroes' hideout and began slaughtering those hiding within. 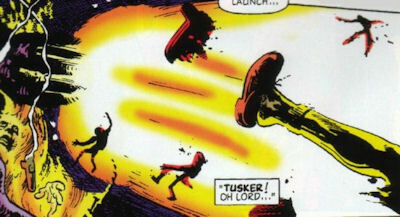 In the confusion of the following seconds, Tusker was informed that Tom Rosetta had been slain, and, confused because Rosetta should have been indestrutible while wearing his mystical stone, Tusker asked fellow hero Rick how the Fury had achieved this; Rick informed him that the cybiote had roasted Tom. Despite it already having eliminated several more powerful heroes with casual ease, when Captain U.K. began to panic at the thought of dying, Colonel Tusker bravely informed her not to worry, as the cybiote had yet to get past his killer toys. With the Fury turned away from him as it slew another hero, Tusker launched a devastating barrage, firing every weapon his toys had, but he merely succeeded in attracting the Fury's attention. Without even turning from the victim it was incinerating with its right hand, it aimed behind itself and blasted Tusker. He was one of the last heroes to fall. (Marvel Superheroes#387 (fb) BTS) - The Fury recalled battling and killing Colonel Tusker and his killer toys. (Marvel Superheroes#388) - Tusker was buried in the superhero graveyard, where Captain Britain later spotted his headstone. 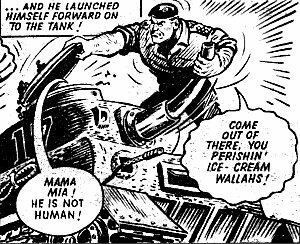 Comments: Colonel Tusker is based on the Beano character General Jumbo, a young boy who also controlled a miniature toy army. Tusker's gravestone reads 1961 -197?, but in the reprinted collection this date had been altered to 1971-198? Miracleman: (Marvel Superheroes#387 (fb) BTS) - Miracleman was an "atomic powerhouse." (Daredevils#7 (fb)) - The Fury invaded the last surviving heroes' hideout and began slaughtering those hiding within. After roasting Tom Rosetta it blasted Miracleman, blowing away the left hand side of his torso, much to the surprise of Captain U.K. and her husband Rick. (Marvel Superheroes#387 (fb) BTS) - The Fury recalled battling and killing Miracleman. (Marvel Superheroes#388) - Miracleman was buried in the superhero graveyard, where Captain Britain later spotted his headstone. Comments: Miracleman is based on the Mick Anglo creation Marvelman, who was in turn based on Fawcett Comic's Captain Marvel. 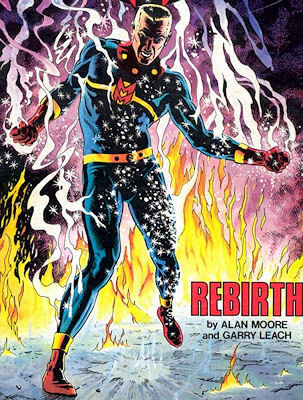 Alan Moore would go on to revive this character and eventually take him across the Atlantic, rechristened (ironically) Miracleman. More recently he's been purchased by Marvel. 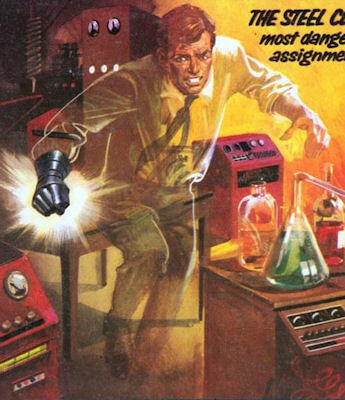 The Iron Tallon: (Marvel Superheroes#387) - The Iron Tallon was a hero who could become invisible. (Marvel Superheroes#388 (fb)) - The Tallon fought the Fury alongside the Crusader and Bash Street Bunty. (Daredevils#7 (fb)) - As the Fury pounded away at the exterior wall of the last remaining superheroes' hideout, Rick tried to contact the Iron Tallon. When he failed to respond, he concluded, correctly, that the Fury had slain the Tallon, and informed his wife, Captain U.K., of this development. Near hysterical, she asked her husband how the cybiote could have slain someone who was able to become invisible. (Marvel Superheroes#388) - Iron Tallon was buried in the superhero graveyard, where Captain Britain later spotted his headstone. Comments: The Iron Tallon is based on the Steel Claw, a villain with an artificial hand who gained the ability to become invisible by absorbing electricity through his metal hand. Eventually he reformed and became a hero. I'm fairly sure the figure on the top left is the Tallon, as he is wearing a costume very similar to the one briefly worn by the Steel Claw (see lower left image). Also the Steel Claw could fire electricity from his mechanical hand. The resemblance might be a coincidence, but I prefer to think otherwise. The Arachnid: (Daredevils#7 (fb) BTS) - The Arachnid was slain by the Fury. Daredevils#7 (fb)) - Later, when the cybiote cornered the last remaining heroes of Earth-238 and began slaughtering them, Linda McQuillan recalled those who had already fallen, including the Arachnid, before concluding that she did not want to die in the same manner as they had. (Marvel Superheroes#388) - The Arachnid was buried in the superhero graveyard, where Captain Britain later spotted his headstone. 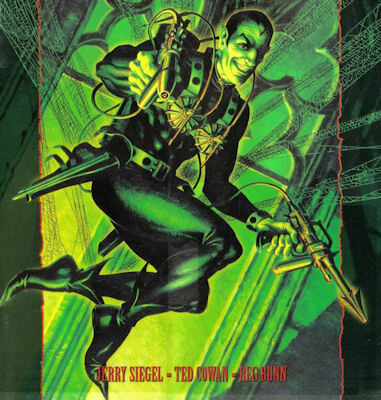 Comments: The Arachnid is based on the supervillain mastermind the Spider, who eventually reformed and became a crimefighter. For much of his run he was written by Jerry Siegal of Superman fame. 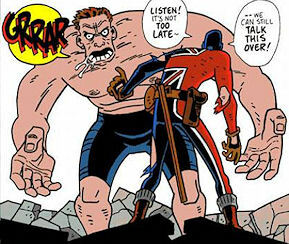 He subsequently reappeared, much older, in the Jack Staff comic, as well as in Albion, a revival of British IPC characters, plotted by Alan Moore, written by Leah Moore and John Reppion, and drawn by Shane Oakley. 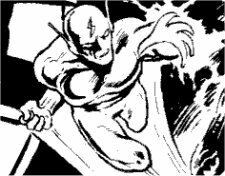 Gaath: (Daredevils #7 (fb) BTS) - The Fury slew Gaath. (Daredevils #7 (fb)) - As the Fury pounded away at the exterior wall of the last remaining superheroes' hideout, Linda McQuillan learned that it had recently slain the Iron Tallon. As the walls cracked under the Fury's relentless pounding, Linda concluded that it was unstoppable, recalling that it had slain Gaath too. 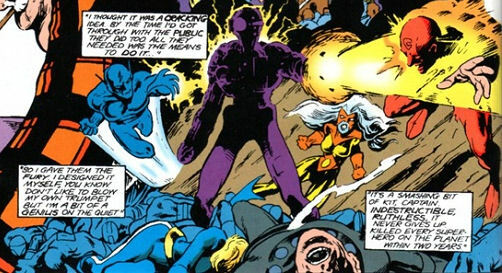 (Marvel Superheroes#388) - Gaath was buried in the superhero graveyard, where Captain Britain later spotted his headstone. 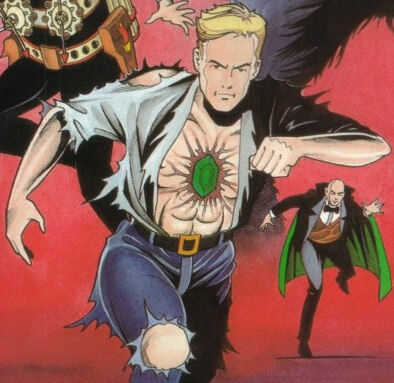 Comments: Gaath is based on the Daily Mail newspaper strip hero Garth, a superhumanly strong man who adventures throughout history, time traveling from one period to another. Gaath's gravestone reads 1814 -1972, but in the reprinted collection this date had been altered to 1824-1982. Android Andy: (Daredevils#7 (fb)) - When the Fury breached the last remaining heroes' hideout, the robotic Android Andy was the first to fall, his back ripped open to strew his inner workings across the hideout by a single blow from the killer cybiote's clublike right hand. (Marvel Superheroes#388) - Android Andy was buried in the superhero graveyard, where Captain Britain later spotted his headstone. (Albion #2) - Andy's remains somehow made their way to another reality, where they ended up in Penny Dolmann's robot workshop (see comments). 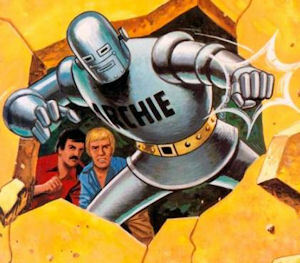 Comments: Android Andy is based on Robot Archie, lead character in the Lion comic, who first appeared in the early fifties. 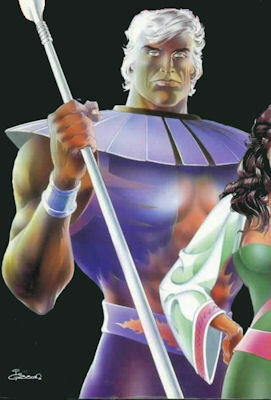 Archie was later used by Alan Moore again when he and fellow creators Leah Moore, John Reppion and Shane Oakley revived dozens of IPC heroes for Wildstorm's Albion. 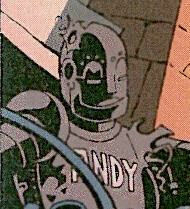 In a workshop where a deactivate Archie was reconstructed, Shane added cameos of dozens of other British robot characters, including, amusingly, Android Andy, whose body, still showing evidence of the damage caused by the Fury, is visible propped up against a wall. 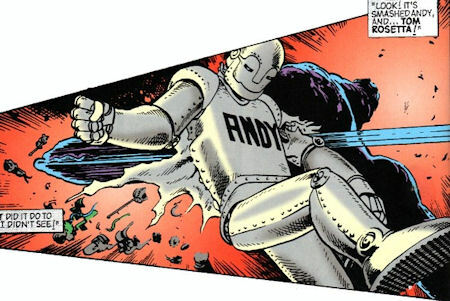 Though it was a throwaway joke, and I am sure none of those involved seriously thought of it as a canonical continuation of Andy, it amuses me to think that perhaps this was 238's Andy which had somehow traversed the realities, perhaps thrown there when Lord Mandragon destroyed Reality-238. 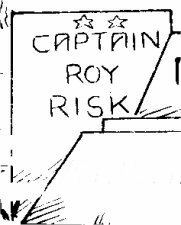 Captain Roy Risk (Marvel Superheroes#388) - Captain Roy Risk was buried in the superhero graveyard, where Captain Britain later spotted his headstone. 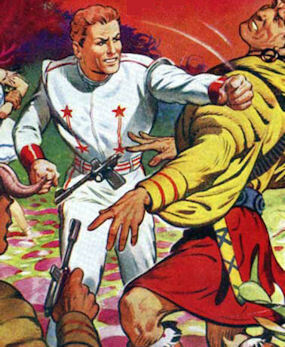 Comments: Roy Risk is probably based on Dan Dare, hero of the Eagle comic, but he might also be space detective Rick Random, another very similar space hero. (Marvel Superheroes#388 (fb) BTS) - ...who also slew Puppetman. (Daredevils#7 (fb)) - Later, when the cybiote cornered the last remaining heroes of Earth-238 and began slaughtering them, Linda McQuillan recalled those who had already fallen, including Puppetman's robots, before concluding that she did not want to die in the same manner as they had. (Marvel Superheroes#388) - Puppetman was buried in the superhero graveyard, where Captain Britain later spotted his headstone. 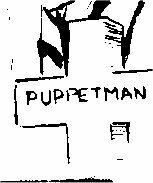 Comments: Puppetman is based on Dolmann, an inventor and crimefighter who appeared in the Valiant comic in the late sixties and early seventies. He battled crime using a variety of high tech puppets. Tom Rosetta: (Daredevils#7 (fb) BTS) - While wearing his glowing stone, Tom Rosetta was supposedly indestructible. (Daredevils#7 (fb)) - When the Fury breached the last remaining heroes' hideout, it swiftly slew Tom Rosetta, somehow circumventing or overwhelming his stone's protection to roast him alive. 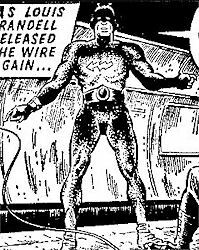 Comments: Tom Rosetta is based on Tim Kelly, who found the mystic eye of Zoltec which granted him complete invulnerability while wearing it. He appeared in the Valiant comic. 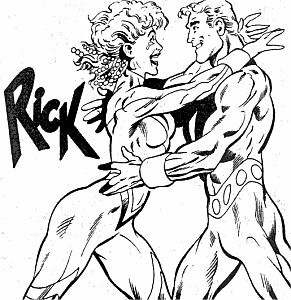 Rick: (Daredevils#7 (fb)) - Rick was the husband of Linda McQuillan, Earth-238's Captain U.K. The couple survived to the end of the superhero purge and were together within the hideout that housed the last heroes of their world when the Fury finally discovered their location. As the Fury pounded relentlessly against the hideout's exterior wall, Rick tried to contact the Iron Tallon, who had been outside. The Tallon's failure to respond convinced Rick that he had been slain. Watching cracks spread across the hideout's wall while the lair echoed with the relentless booming of the Fury's fists, Linda found her husband's news the final straw, and she struggled to comprehend how the Fury had managed to slay someone who could become invisible. Rick tried to comfort her, telling her that everything would be okay, but Linda reminded him that it had killed Gaath as well. Admitting her terror, Linda told Rick that this time they were not going to win, but Rick remained confident, at least vocally. Seconds later the Fury breached the wall and commenced slaughtering those inside. Rick witnessed it slaying both Android Andy and the supposedly indestructible Tom Rosetta, but his confidence was finally shaken when it slew Miracleman, something Rick believed to be impossible. Horrified, Rick listened as Linda recalled other fallen allies, and she pleaded to him that she didn't want to die this way. When it slew Colonel Tusker, Rick snatched Linda off her feet and flew her to a transporter tube, telling her he would beam her away and follow later, something she loudly protested against. Perhaps alerted by her cry, the Fury noticed the couple, and Rick, unaware of the cybiote closing behind him, hurriedly activated the transporter. With no time to calibrate the destination accurately, he simply hoped for the best; meanwhile Linda, unable to help from within the transparent transporter tube, noticed the looming Fury and cried out a warning, too late. As she beamed out, Linda watched the Fury grab Rick and kill him. (Marvel Superheroes #388 (fb) BTS) - Linda ended up on Earth-616. (Captain Britain II#14) - Years later Omniversal protector Roma snatched Rick out of time before he died, changing Linda's memories so that she now recalled him vanishing even as the Fury reached for him, and also changing the timeline so Rick was still alive. She reunited the happy couple and sent them to deal with the dictator Opul Lun Sat-yr-Nin, who was slaughtering the people of her Earth. Comments: Rick is based on Richard "Dicky" Dauntless, a.k.a. Young Marvelman, the partner of Marvelman, which would explain why witnessing Miracleman's demise was what finally shook Rick's confidence that the heroes had a chance of surviving. He had his own title in Britain in the late fifties and early sixties. The Hulk: (Daredevils#8 (fb), BTS) - President Ronald Reagan pardoned the Hulk. This incident was later cited by Sir James Jaspers as an example of how superhumans were being allowed to get away with breaking the law. Comments: We never saw Earth-238's Jaspers making his landmark speech that launched his anti-superhuman campaign, but Earth-616's Jaspers mentioned the Hulk's pardoning and Captain U.K. confirmed that the two speeches were identical, word for word. Assuming she was literal and accurate when she said that (e.g. Jaspers-238 didn't namecheck a similar incident involving individuals with different names), that would mean that there was a Hulk on Earth-238. However, there's nothing to say that just because he was (a) named the Hulk and (b) described as a rampaging monster, that it had to be the green alter ego of Bruce Banner known to Earth-616. 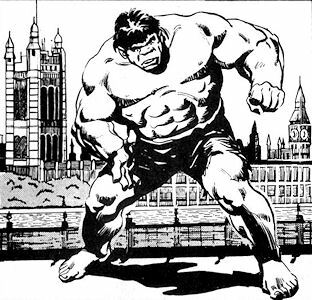 It's purely speculative, because I'm sure Alan Moore didn't have any plans for the Hulk who was mentioned to be represented on Earth-238, but if we extrapolate along the lines of the other Earth-238 heroes being counterparts to old British comics characters, then there are at least a few individuals who would fit the rampaging monster descriptor. One would be the superhumanly strong Royal Marine Captain Hurricane, who suffers from "ragin' furies." And to prove I'm not the only person who noticed the similarity, he turned up in the 2000s noticably more Hulk-like in both Paul Grist's Jack Staff (as Hurricane) and Moore etc. 's Albion. Another option would be Odham's Missing Link, who debuted in Fantastic, a title otherwise entirely composed of reprinted Marvel strips. Odhams also had the license to reprint the Hulk over in Fantastic's sister title, Smash! As well as his brutish nature and superhuman strength, he even spoke like the Hulk - "Link is big! Link is strong!" Unsurprisingly, within a few months Marvel apparently objected to the marked similarity between the Hulk and the Missing Link, and Odhams mutated their pre-human monster into the superhero Johnny Future. Arguably the Hulk is not really one of the last surviving heroes of Earth-238, as we don't actually know when he died during the purge - he may have been an early casualty. Indeed, we don't know for sure he did die - though Jaspers and the Fury both believed all the world's superhumans to be dead, it is conceivable that the Hulk evaded them and was only thought to be dead, either staying under cover or escaping into space, extradimensionally or into another reality like Captain U.K. did. Nevertheless, if only for completeness' sake, I feel he should be included in this entry. 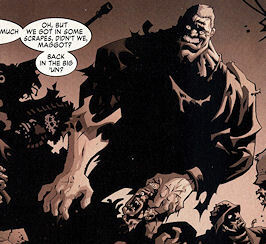 Nope, this isn't the Hulk - it's Odhams' Missing Link - see why Marvel wasn't happy? All characters mentioned or pictured are  and © 1941-2099 Marvel Characters, Inc. All Rights Reserved.